A few months ago, I splurged on a small package of New York strip bison steaks thinking someday very soon I’d make Jesse a nice dinner when we had a night on our own. That someday just now arrived and when I opened the package I found a bonus! Inside were three steaks instead of two. I suppose I could have called a friend for dinner, but instead selfishly saved the extra piece for pizza. What my friends don’t know won’t hurt them, right? This pizza is so worth the splurge. 1. 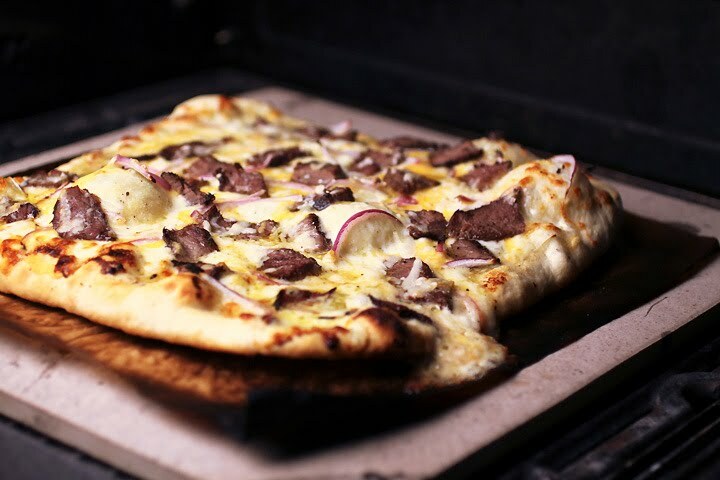 Place a square pizza stone on one side of the grill and preheat on high. Brush the steak with a little oil and season with salt and pepper. Grill the steak to rare. Set aside to cool for a few minutes leaving the grill on. Slice any fat off the steak and slice into thin bite size pieces. 2. Cut out a piece of parchment paper the size of your pizza stone. Place it on a cookie sheet. Divide pizza dough in half and set the other aside for another pizza. Roll out dough and brush with olive oil. Move the dough to the parchment. 3. Spread a layer of garlic cream sauce onto the dough. Top with mozzarella, cheddar, lots of onion slivers, steak and Parmesan. Season with salt & pepper and drizzle top with a little olive oil. 4. Slide the pizza with parchment onto the baking stone. Cook for 5 to 8 minutes until the top is bubbly and the bottom crust is deeply browned. 1. In a stand mixer bowl add the water, yeast, and honey or sugar and let sit for 5 minutes until foamy. Add the flour, olive oil, and salt and mix with the dough hook until well kneaded. If you use bread flour you’ll need to drizzle in a little more water until the dough forms a ball. 2. Olive oil a large bowl. Remove the dough from the stand mixer and knead on a clean surface for two more minutes. Place the dough in the oiled bowl and cover with plastic wrap. Let the dough rise in a warm place for at least an hour before using. Notes: I use part whole wheat flour in my pizza dough sometimes, when doing this add a little extra water if needed until the dough is lightly tacky. 1. In a saucepan melt the butter and olive oil together over medium heat. Add the garlic and sauté for about 30 seconds until fragrant. 2. Turn the heat to medium low and add the rest of the ingredients, but add the cheese last so it doesn’t hit the hot pan and seize up. Stir constantly until it coats the back of a spoon. Turn off the heat and move the sauce to a bowl. 3. Sauce will thicken quite a bit as it cools. Recipes and pictures by Laura Flowers. Why do i continue to torture myself with looking at blogs BEFORE i have eaten. This sounds like the perfect pizza for me right now. They might know now Chef E, but I have a running head start! OMG this is so wonderful! I just did a very similar pizza, using onion dip! Don't you just love getting surprises like that! Your pizza looks heavenly, especially with that garlic cream sauce. Ryan and I are making pizza for dinner, and now I feel inspired to try something a bit more exciting. Thanks for sharing sweet woman! This pizza sounds fantastic! I love the sound of that garlic cream sauce. To die for. I love the garlic cream sauce. I have this recipe that I printed form you a few months ago and I use it with pasta. Love it Laura. I am totally loving this recipe. I must try this. My husband would love it. I love the sound of that garlic cream sauce- yum! The pizza looks great. I bet the bison steaks were awesome! What a great gourmet looking pizza. ...even just the name here... there is not a single ingredient listed that doesn't make me drool a tiny bit. and garlic sauce? puh-lease! so appetizing, this is going to have to be made ASAP! Meaghan thank-you for the really nice comment! Wow! That is a serious pizza... Love it! Your posts and your pictures are wonderful, but you've really outdone yourself with this Pizza recipe. Can't wait to try it. Do you mind if I share it on our Facebook page? I know our readers would love it. That would be nice thank-you! Can you link it back to my post please? I was thinking of making this this weekend,but I realized that you don't mention anywhere what temperature to set the oven to! Could you please enlighten me? I mostly cook pizza on my grill, but to cook one in the oven place a pizza stone on the lower quarter of the oven. Remove the rest of the racks so it's easier to get the pizza out. Then preheat the oven to 500 degrees. Make the pizza on parchment paper the size of your pizza stone. Slide a cookie sheet under the parchment and slide the pizza with parchment onto the stone. Bake the pizza watching carefully until the top is bubbly and the crust is deeply browned. This is typically 5 to 10 minutes, but can be as fast as three minutes. Just watch it pretty close.